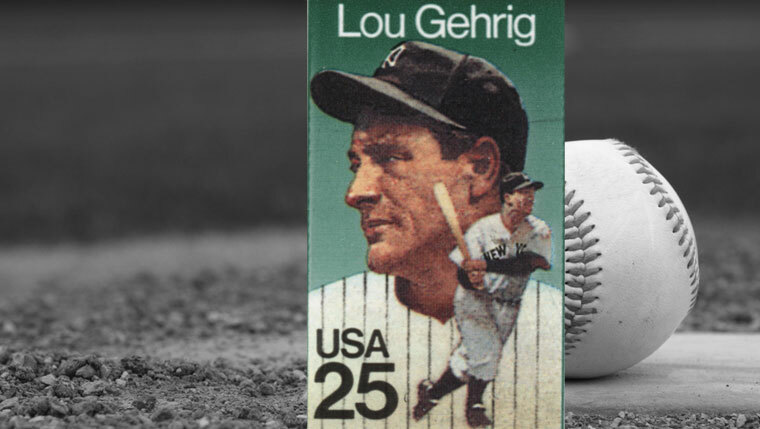 On July 4, 1939, baseball great Lou Gehrig said good-bye to the game and his fans after being diagnosed with amyotrophic lateral sclerosis, a rare nervous system disease that would come to bear his name. While much is known about that particular day, less well known is what went into making the diagnosis -- including Mayo's role. But thanks to some recent reporting by the Rochester Post-Bulletin, we know a bit more about The Iron Horse's time in Rochester and what progress has been made in the fight against ALS. Reporter Paul Christian writes that not long after Gehrig's consecutive game-playing streak came to an end on April 30, 1939, he and his wife, Eleanor, came to Rochester. Then P-B sports writer Joe Kernan picked up the Gehrigs from the airport when they arrived in Rochester on June 13. Kernan wrote that as the effects of Gehrig's disease worsened, Eleanor had called Mayo Clinic in Rochester and was transferred directly to one Charles William Mayo, M.D., who reportedly told her to "bring her husband in as soon as possible." The Gehrigs flew to Rochester from Chicago, where the New York Yankees were playing. The next day, doctors at Mayo began a series of tests than would spill over into the next two days. The Gehrigs left Rochester on Tuesday, June 20, one day after Lou's 36th birthday. Before they left, however, Gehrig told reporters that "a diagnosis has been made but that it would be inappropriate for him to talk about it before speaking to the Yankees front office." The next day, back in New York, it was officially announced that doctors at Mayo Clinic had diagnosed Gehrig with ALS. The disease would take Gehrig's life just two years later -- on June 2, 1941 -- when he was just 37 years old. Skip ahead 73 years, and the P-B reports, much has been done at Mayo Clinic to find a cure for Gehrig's disease. Much of the current ALS research being done at Mayo Clinic is focused on what the newspaper calls "a patient-derived stem-cell treatment to slow -- or even 'arrest' -- progression of the disease." Anthony Windebank, M.D., deputy director for discovery in Mayo Clinic's Center for Regenerative Medicine, and his team are working on a way to effectively and safely take "newly grown stem cells" from ALS patients and then guide those cells into protecting those patients' "neuromuscular function." After being taken from patients, the stem cells are "treated to make them more likely to make factors protective to nerve cells," Dr. Windebank tells the P-B. That's something an ALS patient's body can't do on its own. The purpose of using the protective stem cells, he says, is to "arrest the patient where they're at in their ALS progression." If researchers can max out an ALS patient's loss of cells at "20 to 30 percent," Dr. Windebank says, then "that person would probably actually have pretty good function." Mayo Clinic neurologist and fellow ALS researcher Nathan Staff, M.D., Ph.D., tells the P-B that if the group's current research study proves successful and safe for patients, it will then "be possible to move on to a larger, Phase II study of 48 patients" to further demonstrate and prove the effectiveness of the potential new treatment.